For example, it used to be that commercials were the part of the service that was intended for taking a bio break, but not in recent years. The commercials are now the most important part (for some) of the service, and indeed some (like me) watch Super Bowl specifically for the advertisements. This year a 30-second advertisement spot on the Super Bowl runs an average of $5.25 million, or $175,000 per second. The average cost of an ad in the Super Bowl has almost doubled over the last ten years. Google observes that those companies that post their ads on YouTube before the game received 3.4 times more views last year than those who didn’t. For example, this year Budwiser’s minute-long advertisement has already had over 8 million views. Over 100 million viewers will watch the program, making it the year’s single most watched television program. Kraft Heinz started a petition to make the Monday after Super Bowl a national holiday called Smunday. Their employees already get that day off to recover, and they want the same holiday for the 16 million Americans who would otherwise call in sick. Not only is food a major part of this holiday, so too are decorations. Consider Supermarkets (named after Superbowl) which decorate the chips aisle as if it is Christmas. If you work for Frito-Lay, it is Christmas. Super Bowl is the modern name, since 1967, for the professional football championship contests, which extend back into antiquity, Roman antiquity to be precise. This will be Super Bowl LIII, the Roman numerals for 53 to honor those Roman roots of gladiatorial contests. This contest is between the conferences of the National Football League (NFL), so named for the “League” the unit of measurement used to express the distance a Roman citizen could walk in 1 hour. The modern game, however, is about four times that length of time, despite the fact that there are four 15-minute quarters. Go figure. The NFL is divided neatly into two unequal halves, the NFC (National Football Conference) and the AFC (American Football Conference). These conferences are each further subdivided into Meetups, Get-Togethers, and One-On-Ones. The Super Bowl will not involve the CIFL (Continental Indoor Football League) as it is not a TLA (Three Letter Acronym). The winner of the Super Bowl will be declared the “world champions of football,” of course ignoring other inhabited countries who may point out that they call soccer “football,” and they have a championship involving not a bowl, but a cup. And involvement from teams from outer space is out of the question. For space action, we’ll have to just wait for the next Star Trek movie. Where does the word “bowl” come from? Originally, it comes from the Rose Bowl, a college football contest, played in Pasadena, CA which is done in an elliptical stadium. 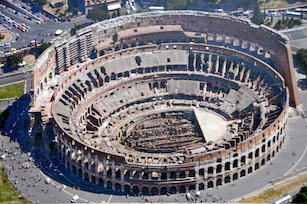 In ancient Rome, a stadium is where foot races were held. But spectator gladiatorial contests like this were held in amphitheaters, like the Colosseum in Rome. To be more historically accurate, it was called the Flavian Amphitheater, so named from the two ancient Greek root words amphi+theatron because they were made up of two theaters joined together or literally theaters on both sides, but that is more ancient history than most people can handle. Super Bowl, while using a clock, does not intend that this is to be understood as representing actual “wall clock” time. Rather, it uses poetic license to represent an epochal period that could last 30 minutes or an hour and a half, given overtimes. Because there’s nothing more American than Super Bowl, there’s nothing more American than dissent and counter dissent. Several people that I’ve spoken to have said they will boycott the game. Some of this is due to player protests involving sitting, kneeling, or locking arms during the singing of the National Anthem. Some halftime singers are staying away to support the protesters. This year in Atlanta there will be protests for a number of local and national issues. A recent poll by the Wall Street Journal and NBC News indicates that the NFL is losing interest from its core audience and viewership numbers are down. Four years ago 75% of men aged 18 to 49 reported they followed the NFL closely. Today that number is down to 51%. NFL ratings have dropped 9.7% this regular season after an 8% drop last year according to Nielsen reporting. There is one reason for celebrating at the end of Super Bowl, especially for “football widows” or “football widowers” like me. It means the end of the professional football season for the year! At least until August. Will you be watching this year? This was not the very first airing of that famous commercial. It had been shown just before midnight on December 31, 1983, on KMVT-TV in Twin Falls, Idaho to be eligible for that year’s advertising awards. Loved the post, Bill. Good thoughts. Thanks. As usual, a great post. The first superbowl was in 1967. The first supermarket was in Queens in 1930 according to wikipedia. I am a better man for having exposure to the incorporated prototypical terminologies employed, i.e. CIFs, or Carbonated Inebreating Fluids.